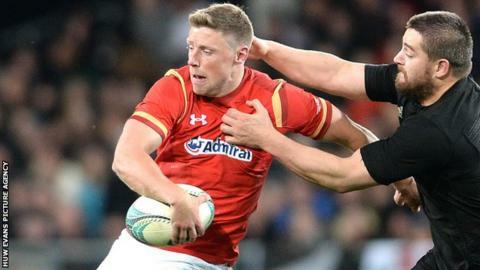 Fly-half Rhys Priestland says he still has ambitions of a Wales recall for the autumn internationals but admits he "doesn't know where he stands". The Bath player produced another outstanding display in Friday's gritty 18-13 Champions Cup win at Scarlets. Priestland has won 48 caps, but last played for Wales in June 2016. "If the call comes it would be great," he told BBC Radio 5 live. "But you're asking me a question I don't know the answer to." Priestland was one of the few players to suffer from the previous "wildcard" selection system, but the Welsh Rugby Union has now altered its policy regarding those based outside of Wales. It means Priestland is now eligible for selection without relying on a wildcard, although the player is in the dark about whether he is on the verge of a return to the Wales fold. "I don't know where I stand, so I can't really comment on that," he said. Priestland is in his third season at the Rec after joining in the summer of 2015, but spent the first two campaigns as deputy to England fly-half George Ford. However, Ford's departure for Leicester has meant more regular starts for the former Scarlets playmaker and his form has drawn comparisons with the World Cup of 2011, when he spearheaded Wales' march to the semi-finals. "I'm really enjoying how it's going," Priestland said. "I'm not sure if I'm better than I was in 2011. Probably not - I'm not in the Wales squad." Priestland kicked six penalties in difficult conditions at Parc y Scarlets to give Bath a second win in two Champions Cup matches. "I have played a few years down here and I can never tell which way the wind is going," Priestland added. "I think that's why my stats have been so bad over the years - but I am happy with how things went. "It puts us in a good position in the group ahead of Toulon back to back."